The most important Sunday of the year has arrived! 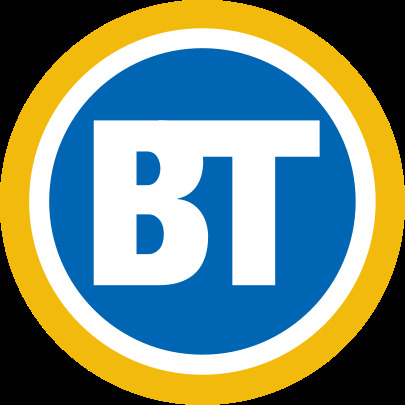 It's common to serve burgers, hot-dogs, fries, etc., when it comes to watching any kind of sporting event. 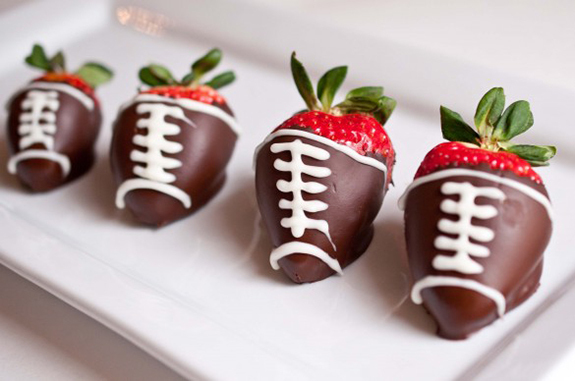 Why not make this one fun by designing chocolate covered strawberries with football designs on them! They are delicious and I'm sure you're friends will get a real kick out of them! In a microwave safe coffee mug add the dark chocolate chips. Don't use a wide bowl otherwise it will be hard to dip the strawberries! Microwave on high for 30 seconds. Stir and repeat until melted. Don't over heat or your chocolate will burn. 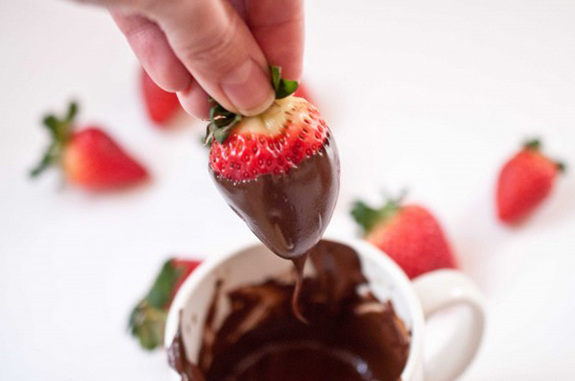 Grab the strawberry by the leaves and dip into the chocolate and swirl around carefully until fully covered. Wait over mug until chocolate has finished dripping. Place on a sheet of parchment paper to dry. 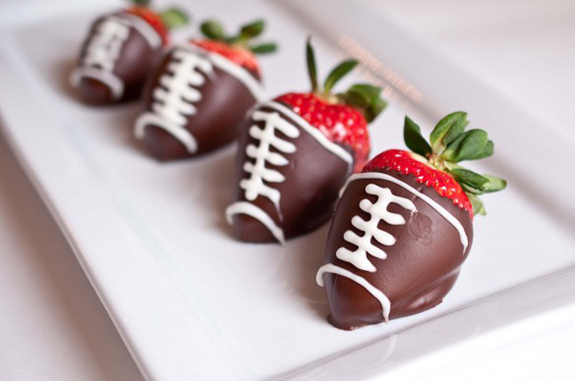 Push forward slightly to avoid a pool of dried chocolate forming in the front of your berry. Allow to dry for 15 minutes. In a separate coffee mug, add the white chocolate. Microwave on high for 20 seconds and stir, repeat until melted. Careful with the white chocolate as it can burn easier. Pour the white chocolate into your piping bag. - Let the white chocolate cool a bit, but not harden, before piping. If it's too hot, it will be very runny. - When piping the lines, double back a bit to avoid the "strings" of white chocolate from dripping down the sides.